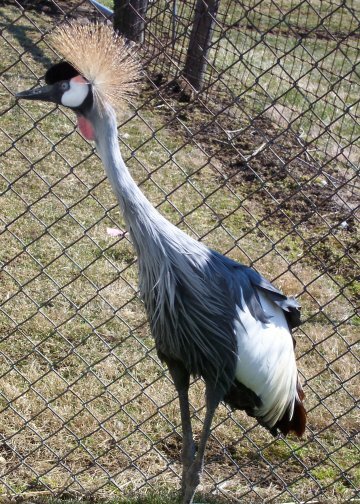 East African Crowned Cranes are found in marshes and grasslands, near rivers and lakes, in eastern Zaire, Uganda, Kenya, and Tanzania. 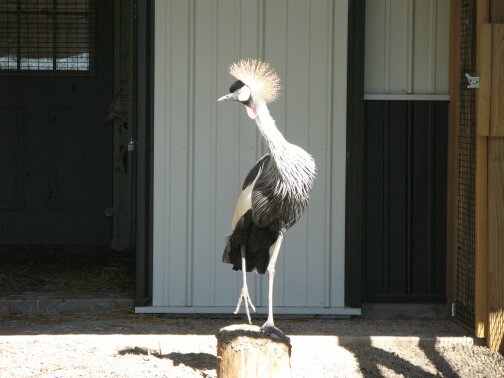 It is the national bird of Uganda. They reach 3 1/2 feet in height, with a wingspan up to 6 1/2 feet. 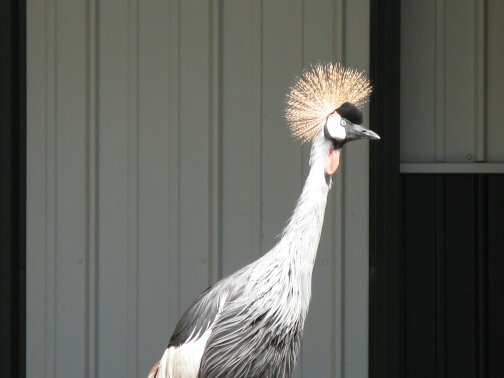 They are easily recognizable by a tuft of yellow colored, bristle like feathers on their crown. They are generally dark gray, with a paler gray neck and underparts. The wings appear mostly white in flight, with black primaries and brown secondaries. The forehead is black and there are red and white patches on the cheeks. Males and females are almost identical, but males can be slightly larger. This is the only crane to perch in trees, with a partiality for solitary trees that allow a wide view. They fly with the neck extended foward with their legs streched horizontally beyond their tail, except in cold weather when they tuck their feet under their breast feathers. Their diet consistes of plants, seeds, grain, insects, frogs, worms, snakes, small fish, and the eggs of water animals. They stamp their feet as they walk, flushing insects to eat. 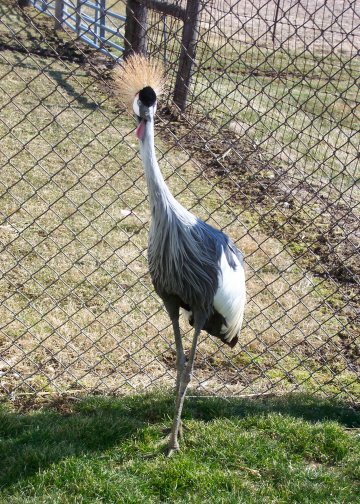 The cranes spend 50-75% of their time foraging for food. 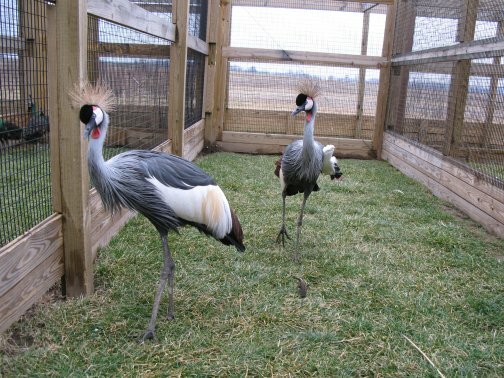 Crowned cranes are monogamous, in that mated birds stay together throughout the year, and will remain paired for life if breeding is successful. They can breed year round. The nest consists of grasses and vegetation and is located on marshy ground or in shallow water. The female usually lays two or three bluish-white eggs. The incubation period is 28-31 days. Chicks can run as soon as they hatch, and fly in 10 weeks. 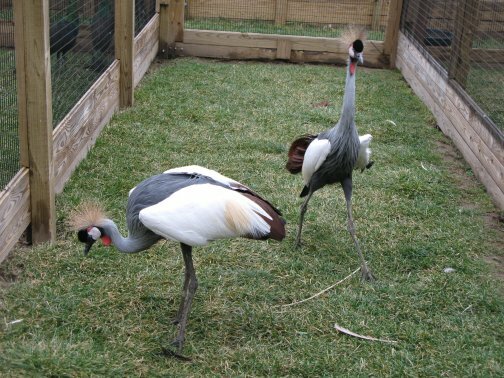 East African Crowned Cranes perform some of the most energetic dances of all cranes, bobbing their heads up and down, bowing, spreading their wings, leaping and flapping their wings, and then landing and circling one another. 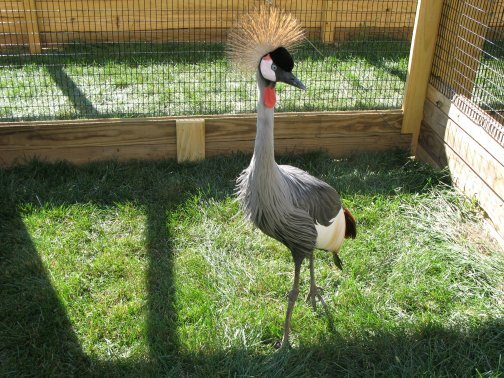 Our East African Crowned Crane, affectionately known as Mr. Crane, has been with us a little over two years. He is old enough to breed, so we will soon be getting him a mate and raising little chicks. In the meantime, Mr. Crane thinks Lisa is his girlfriend and takes every opportunity to perform the dances described above for his favorite girl! 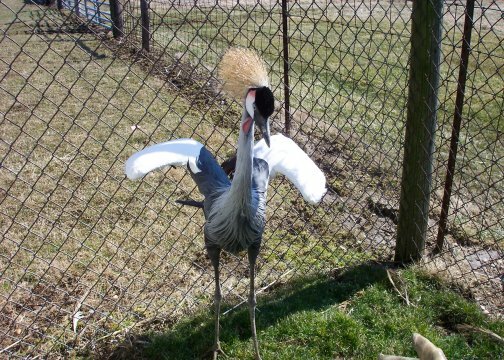 Mr. Crane definitely exhibits the social and gregarious behaviors typical of his breed!